Good times are always had at our monthly socials and meetings. 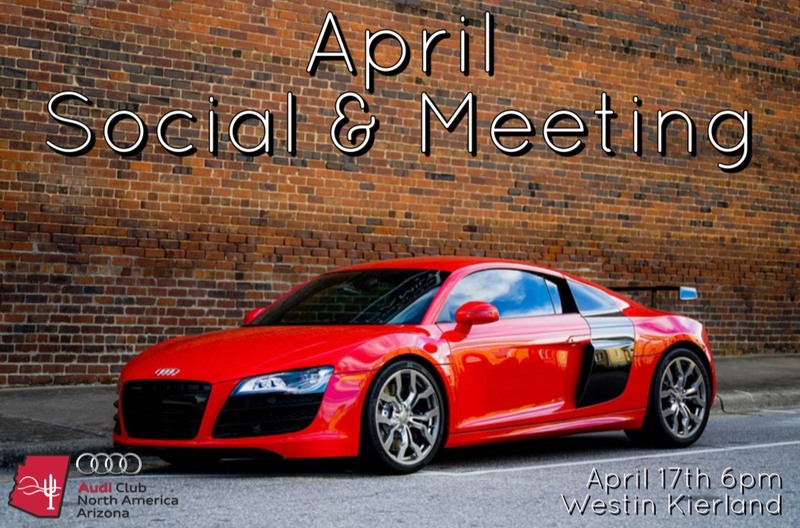 Join us on April 17th and hear about all the fun things we have in store for the club! Our monthly meeting are always the 3rd Wednesday of every month at the Westin Kierland in Scottsdale. Members and Non-Members are welcome to join us in the on the patio outside by the Waltz & Weiser Whiskey Bar and Cantina at the Westin Kierland for some drinks and bites from 6-7pm. Members are encouraged to attend the meeting following from 7-8pm. Make sure you bring your Audi and have the valet park it in Audi Lane. Hope to see you there.